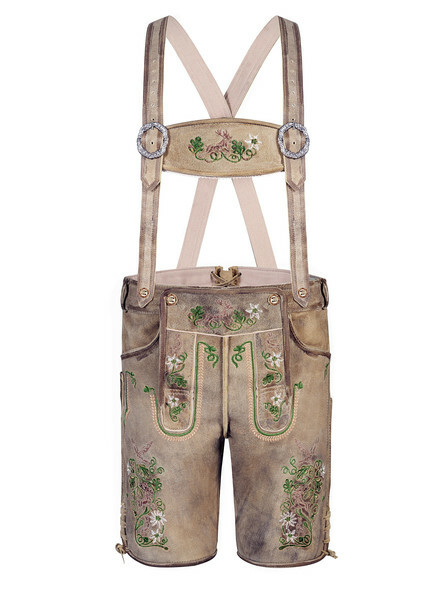 In the past traditional lederhosen were working clothes for famers and hunters. 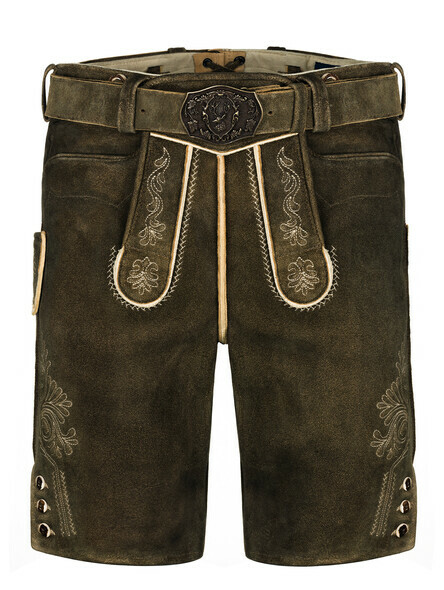 Today short Bavarian lederhosen are a festive outfit for men. 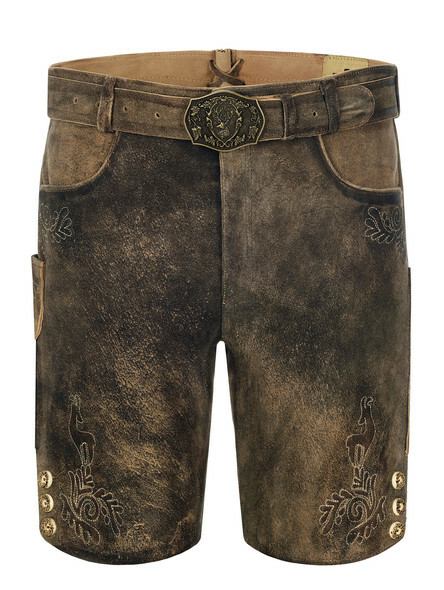 Short lederhosen pants already have an eventful history behind themselves. 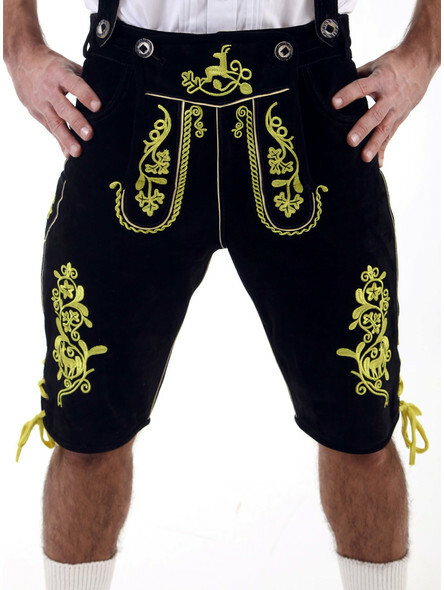 In the meantime, traditional German clothing became a symbol of attachment to one?s homeland and express a down-to-earth attitude. Now, it is a modern trend ? 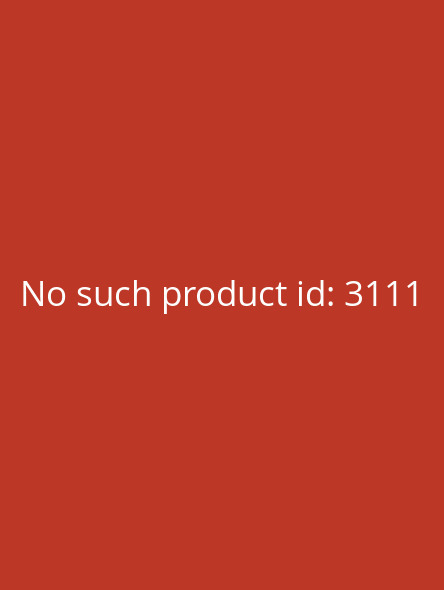 we would even say ?en vogue?. 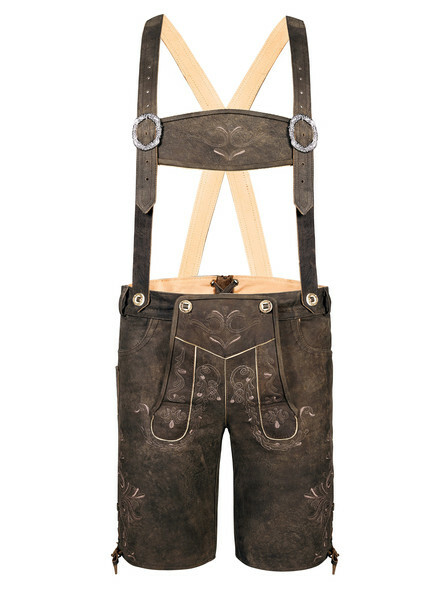 Here you will find a wide selection for men?s Oktoberfest lederhosen costume. 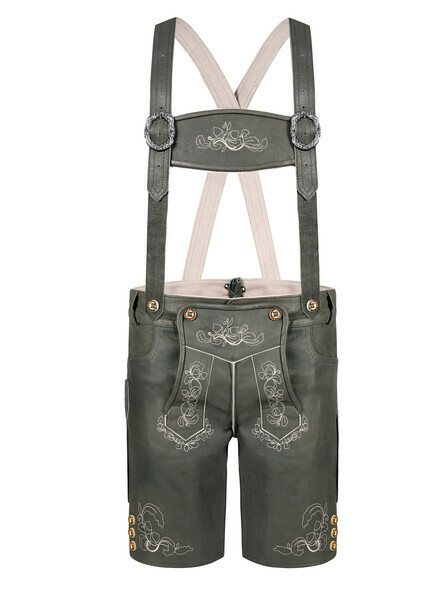 Everyone who is already a fan of short lederhosen or who would like to become one should not miss the following tips. 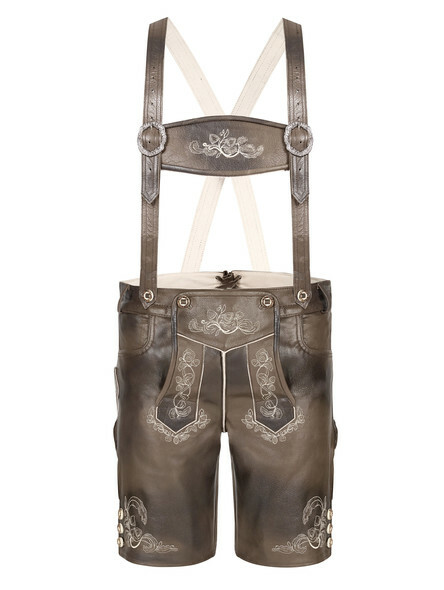 Due to generous leg room, authentic, short lederhosen used to be worn mainly by workers. Later they were also worn by traditional costume clubs and ?Schuhplattler? dancers. 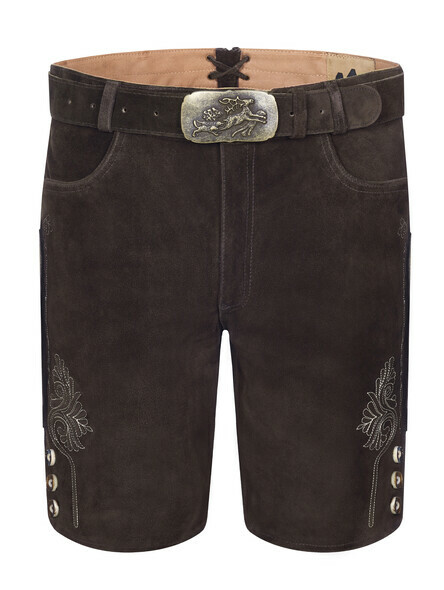 Traditional lederhosen shorts end just above the knee. 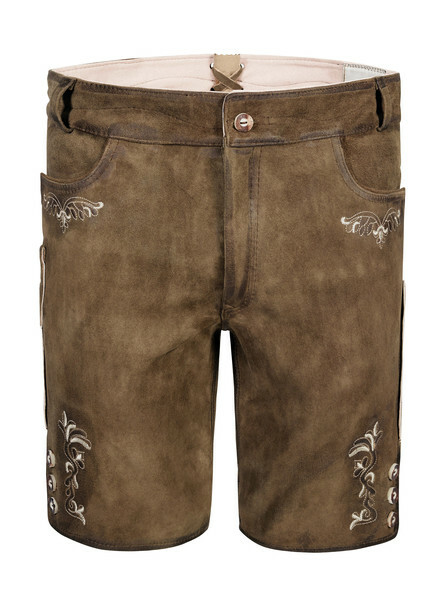 Important: hotpants-like cuts have no place in the range of traditional Bavarian clothing. Of course, we always make sure that our models remain true to the rules of tradition, but leave room for personality. 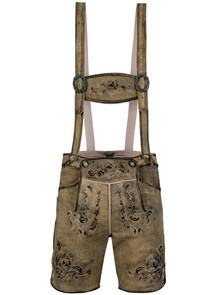 Short lederhosen are mostly worn by young men, which in no way means that they are reserved only for the younger generations. 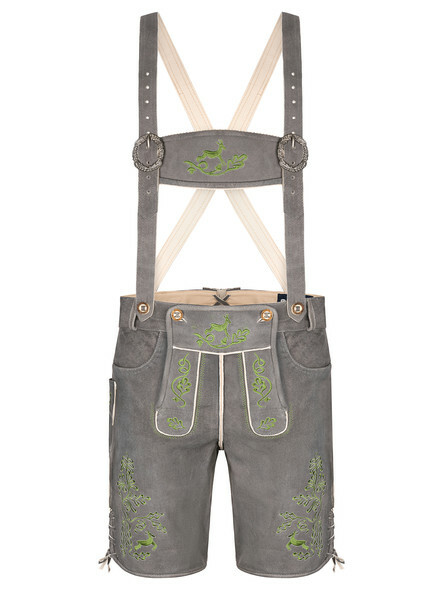 At first glance, these lederhosen may seem a little bit fresher and modern than the knee-length lederhosen. Besides, it is more pleasant for many traditional customers not to feel a waistband around the hollow of their knees. Let your individual style guide you, in which Oktoberfest lederhosen you can feel most comfortable and you can celebrate long parties. It is not only the type of leather that determines its appearance. The quality and wearing comfort are relevant as well. Obviously we attach great importance to the highest quality raw materials. 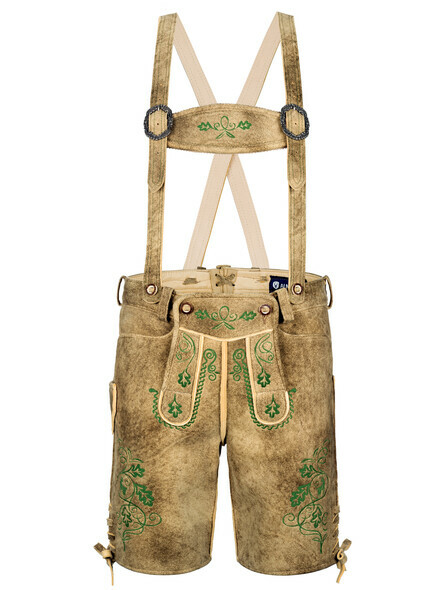 Nevertheless, we offer different lederhosen made of different materials at different prices ? so there is a pair of lederhosen for everyone. Waste product in the food industry, valuable raw material in the clothing industry - cowhide leather is probably the most common leather in the world. This is the reason why it is also used in our traditional lederhosen for men. 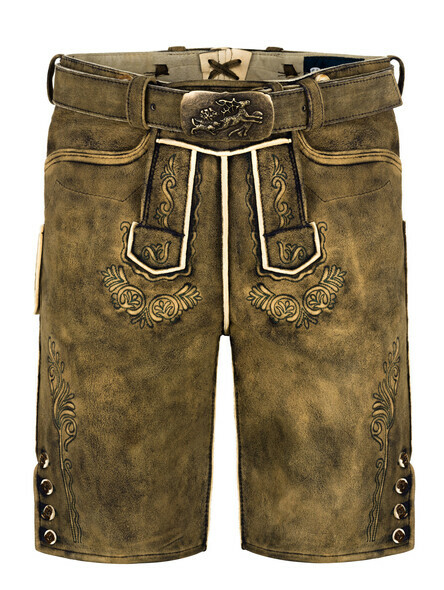 Due to the high occurrence, it is particularly cheap and forms the basis of our most favorable lederhosen, the price-performance winners. 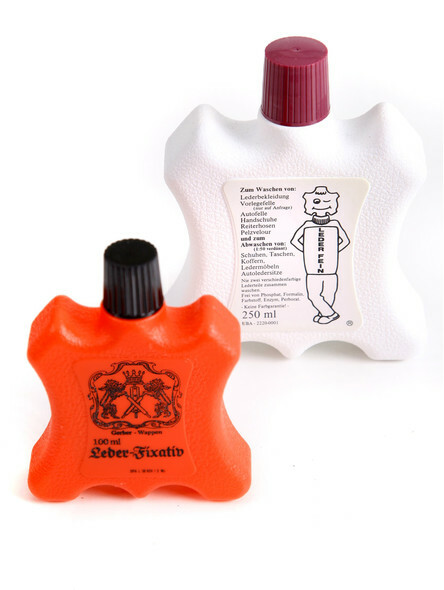 Nevertheless, this natural product offers outstanding qualities: it is robust, durable and comfortable. Buffalo leather is also very resistant, but with slightly larger pores. 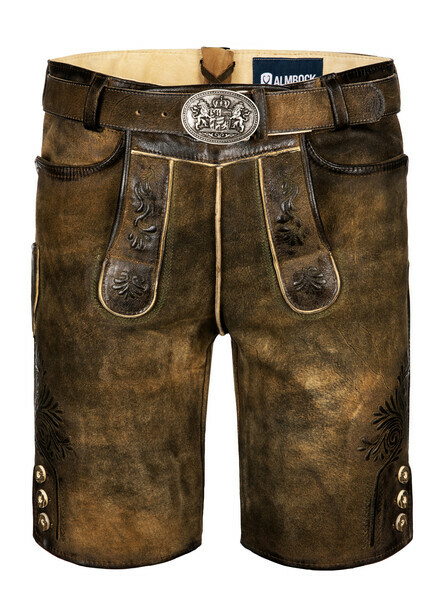 Some of our lederhosen are made out of this material. Compared to the classic cowhide leather, these models look particularly rustic. 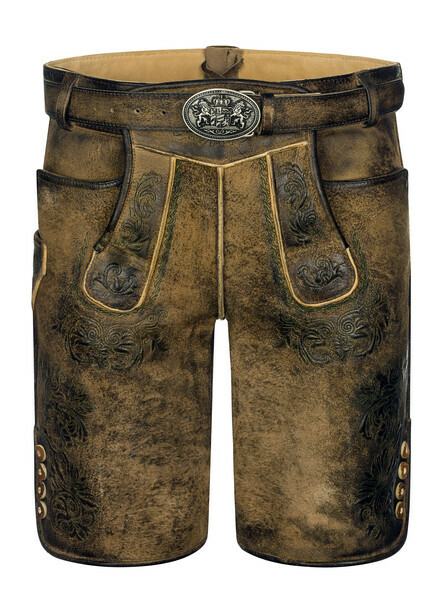 Buck leather , the leather of the goat, has been used in the manufacture of Bavarian lederhosen for a long time. 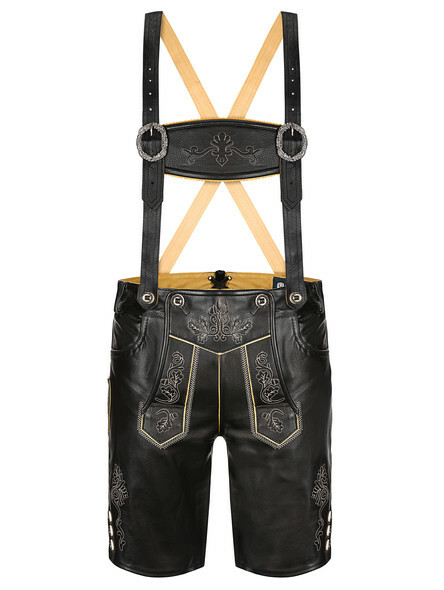 Robust, supple and lighter than other types of leather, it gives the lederhosen durability and uniquely supple fit. 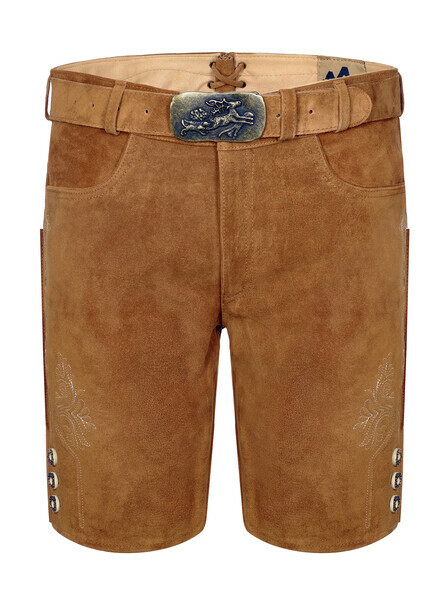 For everyone who likes it particularly exclusive but does not want to choose a chamois-tanned deerskin trousers should choose a chamois tanned buck lederhosen. The leather gets processed in a complex tanning process. 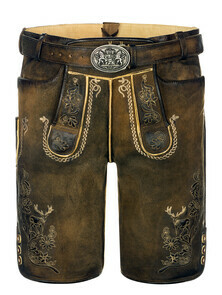 This is the reason why every pair of lederhosen has a unique look and a luxurious finishing touch. Traditional, German lederhosen made of deerskin are the highest quality masterpieces of Bavarian costume. With its natural color gradients and the occasional scarring, it is one of the finest leathers. The elaborate, chamois tanning brings out this unique grain particularly beautiful. Each pair of lederhosen is a unique masterpiece of nature. 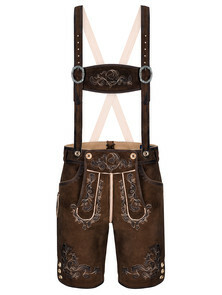 It?s the small but subtle difference that makes the short lederhosen to a special product. Decide which one fits your personal style the best. Do you already own a pair of traditional shoes? 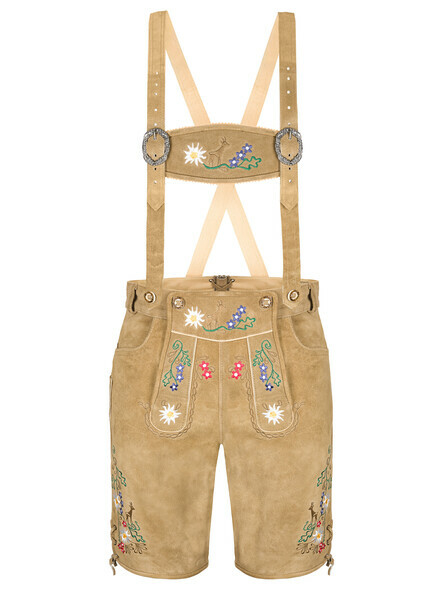 Then make sure that their design harmonises with the lederhosen. Do you already have found your favourite traditional shirt? 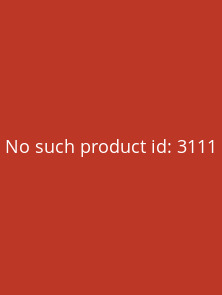 In this case you should find a harmonious colour combination. In our online-shop you will find black, brown and beige models, lederhosen with antique look, used-look and more or less elaborate embroideries. You can choose between different materials: nubuck, nappa or smooth leather. Discover our variety of traditional lederhosen! Lederhosen have to fit. 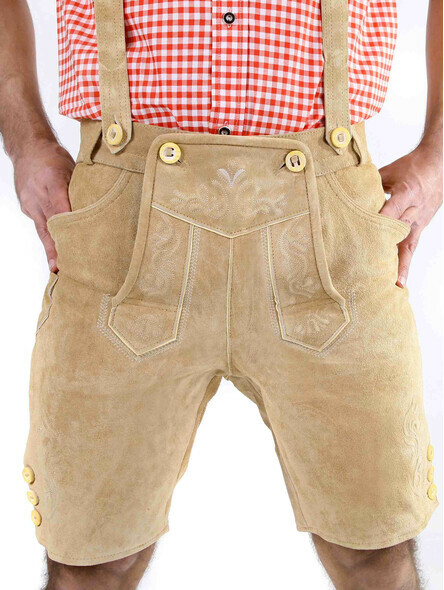 If you want to prevent the lederhosen from flapping around your knees after wearing it several times, you should make sure that they fit slim the first time you try them on. Lederhosen should fit like a pair of jeans, that actually fit but you wouldn´t buy them because it would be too uncomfortable in the long term. 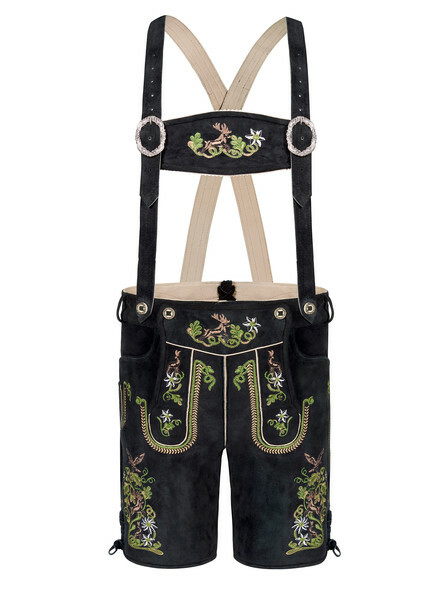 For this purpose, the classic lacing at the back of the short lederhosen can be opened at the beginning. 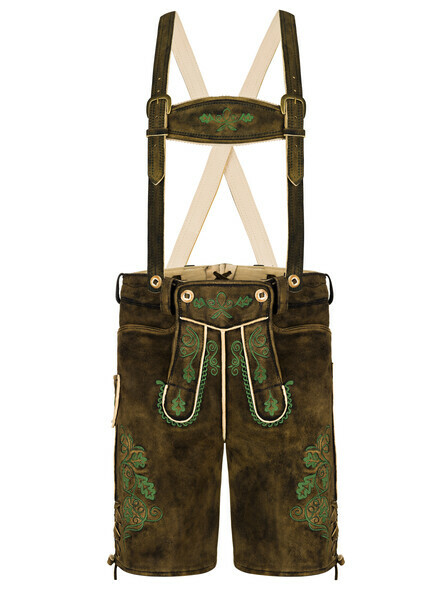 The more often the traditional lederhosen are worn, the better it will fit. 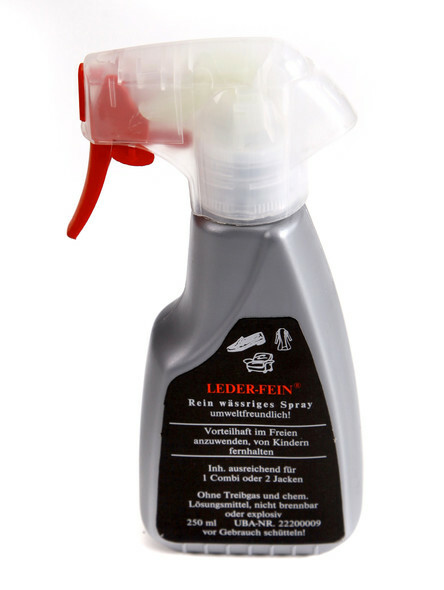 The leather becomes a little wider, smoother and a greasy note that is highly appreciated by connoisseurs. 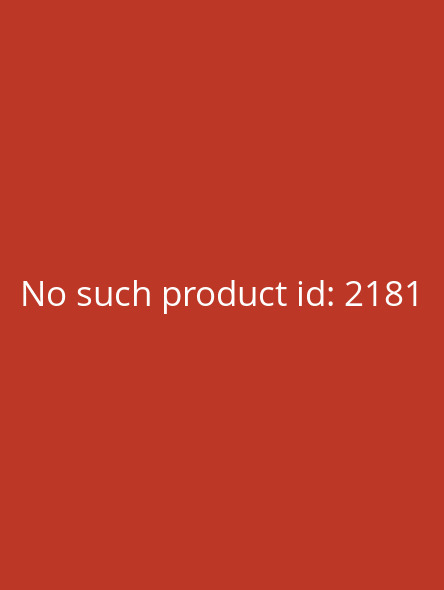 For each of our products you will find a size calculator/ or a size chart. This should help you to find the right size quickly. 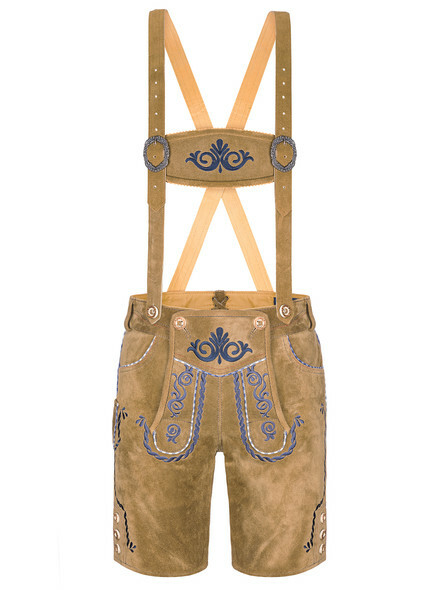 Not only at the Oktoberfest or other fairs ? 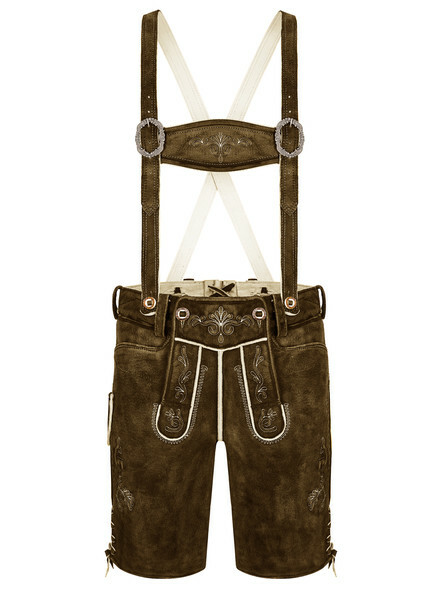 lederhosen are a ?must-have?. Also on weddings, festive occasions or even on carnival they make a good figure. Depending on the occasion and your own preference, you can of course design your lederhosen outfit individually. The suspenders, which are included in each of our classic lederhosen ? can be dropped if you decide to wear a traditional vest. 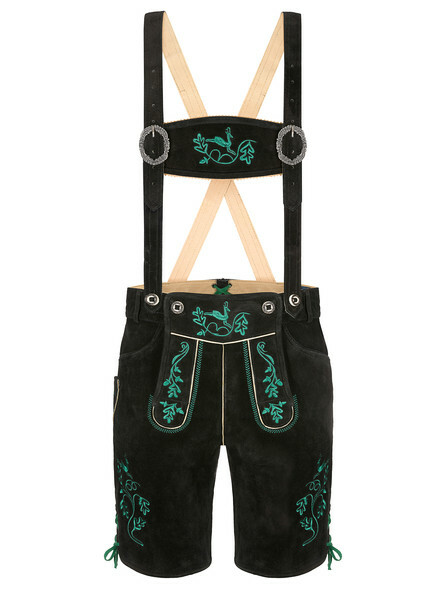 If you prefer to wear your lederhosen with a nice belt a model without suspenders or flap, but maybe with a practical zipper, could make you happy. 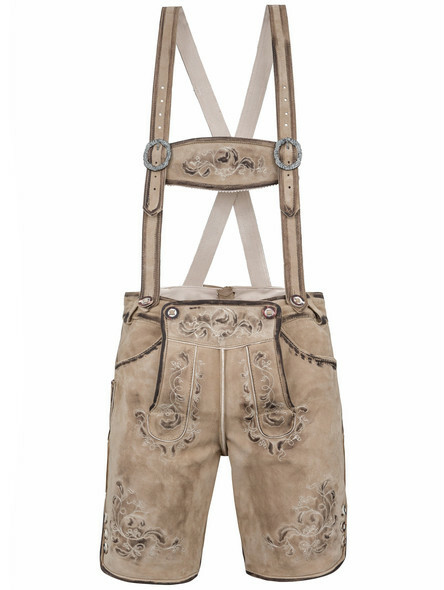 BEspecially short lederhosen can be combined as you like it and according to your personal style. 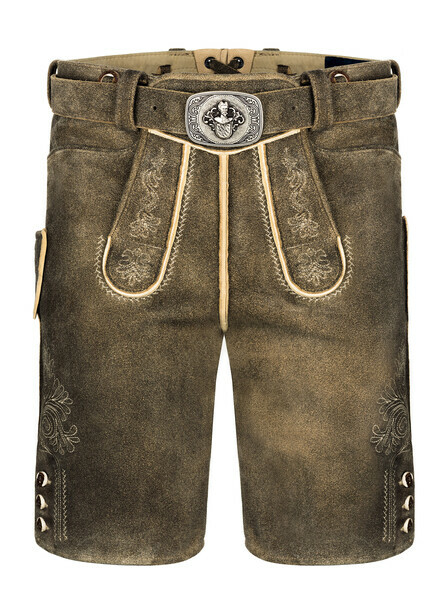 The cut is similar to that of shorts, so you can wear your lederhosen with a classic traditional shirt or with a chic shirt or casual shoes. Live your personal style ? after all, traditional costume should make fun! Now it´s time to choose your personal lederhosen. 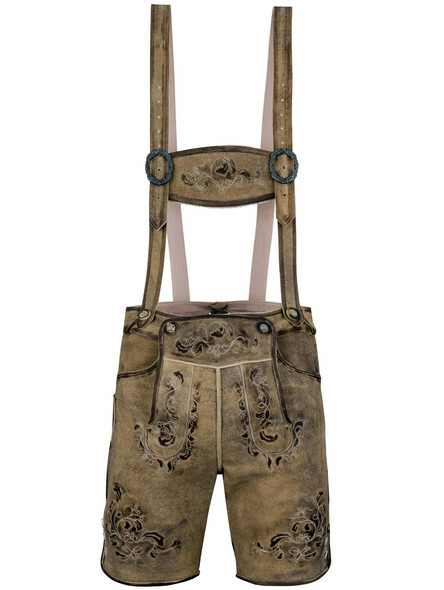 We hope our mentioned tips help you to find the perfect lederhosen for you. 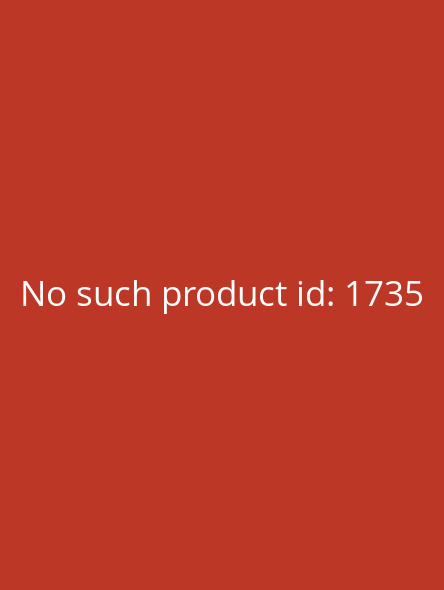 In addition to a wide selection in our online shop, we offer fast worldwide shipping which is even free of charge within Germany. 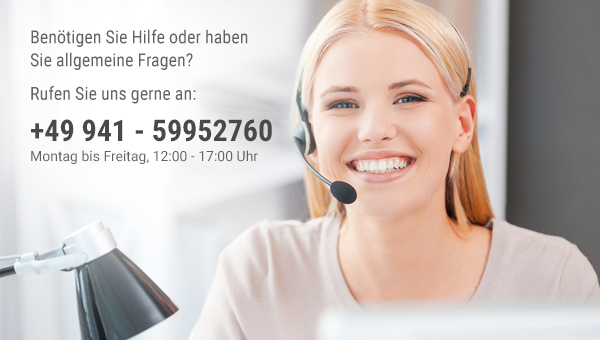 For any further questions or suggestions, please do not hesitate to use our contact form contact form or contact us by phone. We hope you enjoy shopping!